Phoenix Scale Technologis redesigned our dual idler conveyor belt scale to follow in the foots steps of the tree and four idler design. You will not see a modular design when you purchese a Phoenix FF2i dual idler belt scale. You will see a masterfully designed full floating weigh bridge. The Phoenix FF2i is a scaled down version of the Phoenix FF3i three idler convert belt scale. We integrated the same full floating weigh bridge, suspended by four “S” type load cells and six check links. With accuracy of +/- of 0.5% on factory approved installations. The new Phoenix FF2i converyor belt scale is coupled with our Legend III belt scale integrator and our under belt contact speed sensor to aid in reaching the +/- 0.5% accuracy. The Phoenix Legend III integrator is the most integral part of the FF2i belt scale system. 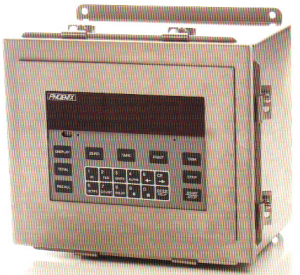 The Legend III is a micro processor base, menu driven unit that can handle any requirement you would need from a belt scale controller. The Phoenix under belt speed sensor is a positive contact design with electronics housed in NEMA 4 rated enclosures. The Phoenix speed sensor mounts to the bottom side of the loaded belt to get the best representation of actual belt speed.